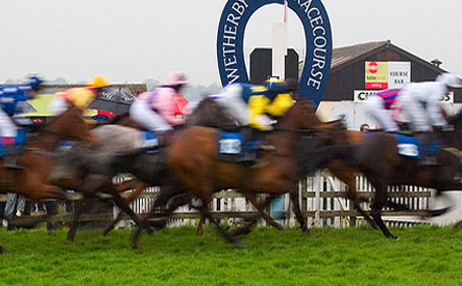 Following an early morning inspection the Wetherby meeting was given the go-ahead. However, this late uncertainty resulted in a number of non-runners. Consequently the field was reduced to three or four horses in the majority of races. With a smaller field theory dictates that there's more chance of picking a winner. And, for some, this did seem to work for a couple of races. But unfortunately it didn't last. However, members soon noticed that the final two races each contained a horse with a drink associated name. Even better the jockey was called D. Bass. Amazingly both romped home in style bringing smiles to our faces as we picked up our winnings from the bookmakers. When it came time to depart the racecourse we found it wasn't just horses that were declared non-runners, but also our coach. After waiting for an hour in an increasingly desolate car park we started to wonder whether we'd be back in time for a final drink. But a local mechanic saved the day and ensured we arrived back only slightly later than expected. All in all it was a very enjoyable trip and our thanks go to Keith Parrott for again taking the time and trouble to organise our day out. Here's to next year and, in case you're wondering, we were back in time for that final drink.